News of this nova reached me only a day after I had obtained my first stellar spectra with my new Alpy 600. As this object might show interesting developments as time went on, I thought I would obtain spectra on every observable night I obtained spectra on 14 nights (“evenings” more like) from 2018-05-02 to 2018-05-27. I have been collecting data at a much greater rate than I could process it - as I was climbing up the processing curve as well as dealing with some acquisition issues, guiding especially. Thanks to Andy Wilson for his tutorial on BASS which I have used for this processing and also to Robin for tips and information. But now I have processed spectra for three of the 14 dates (May-05, -13 and -27) and I am pleased with them. Here are the profiles, with Robin Leadbeater’s for comparison - and 1D fits files are attached too - but not here : see duplicate post under "Alpy 600 Calibration". I am not sure I have the instrument response correction right, but I am pleased with the sharpness of the lines and to see that most of the lines are triplicated i.e with most of the prominent lines having two “side lobes”. 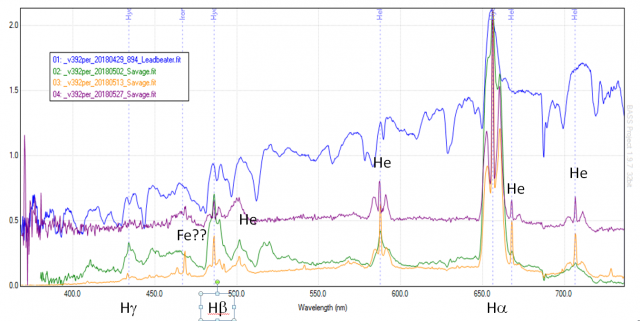 I hope I have identified the He lines correctly – I am suspicious about the Fe line (which BASS reports). I have read practically nothing about the spectra of novae as yet, but I see these as being blue and red-shifted versions of the central line, which conjures up the image of an accretion disk with material on either side approaching us and receding. If this is the case and if I have my sums correctly, the velocities are some 1,000-2,000 km/s, with the approaching material tending to be slower. Can this be correct? Also, it seems to me that these have developed with time – the side lobes aren’t prominent in Robin’s very early spectrum, nor of mine, 3 days later (2018-05-02). By 2018-05-13 they are well developed (easily visible on the raw images too). These are hot off the press, and I would welcome feedback on the results – e.g. should I be concerned about the instrument response correction? I will be tackling the other 11 night’s spectra in the coming days. Eventually I will be subjecting the whole lot to a more detailed analysis and, before getting too far advanced, I’d appreciate hearing opinions about the accretion disk (novae are supposed to have them, I read) hypothesis and whether radial velocities really can be as high as I suggest. In fact I’d be grateful for a pointer to a primer on the spectra of novae and any early papers/comments on this one. The instrument response is difficult to get right because of the high air mass at low elevation. I am now using the nearby star HD29526 as the reference with the A0v Pickles spectrum. I rather like the last one, the "double smoke ring" modelled by prof Steve Shore! Edited to correct a blizzard of typos ! No two novae behave exactly the same though ! for this further wealth of information. Plenty to digest! Nice spectra of a very interesting object. Those are good looking spectra. I don't have a detailed knowledge of Nova spectra, so I am glad to see that Robin has provided some useful information and links. I suspect your response correction is working reasonably well, but it is difficult to tell how good it is with an evolving spectrum like that of a Nova. A good way to check is to take spectra of a couple of standard stars, like ones with Miles spectra. Use one of them to create the response correction, then apply it to the other star and see how close it is to the Miles spectrum. Noting these are the versions of the Miles spectra which have not been dereddened. You will also need to choose stars and times to give similar altitude when obtaining the spectra, so the effects of the Earth's atmosphere are similar. I am glad you found the BASS tutorial useful. I have a feeling I did not include normalising the spectrum to unity over a selected wavelength range that tries to avoid any significant spectral lines. This helps with comparisons and is a standard approach when submitting spectra to a database or campaign. When comparing spectra on a plot I then either overly them or artificially apply an offset in BASS in order to see details and changes. Great to see you are already getting excellent results from your Alpy. I should log on more often! My last attempt with V392 Per was on 6th - very dim and almost swallowed in twilight. Low altitude meant that I had nearly 50% of the 'scope's aperture obstructed by the bottom of the shutter of my observatory too. I feel fortunate that I got any kind of image as I could only detect the faintest ghost in the guide camera image and it was more luck than judgement getting any light from this object through the slit. Only the Ha complex was detectable, but it is and here is the result, alongside the rest in an Excel normalised stack. Andy, Thanks for the tip about verifying response curves. I need to work at this aspect a bit more. I'm sure I am not getting atmospheric bands out well - the BASS method of picking and spline fitting to smooth an initial response curve doesn't get the detail of these for me (and tends to become unstable when I try). The above graph is normalised and plotted so that the pedestals either side of the Ha peak are 10 units apart and the Ha central peak is 100 units relative to the pedestals. It seemed easier to do this in Excel than in BASS, but I don't end up with a set of spectra I can submit. I need to get to grips with the BASS way of doing this (I think I understand the basics of how to do it). Indeed one of my next tasks is to read up about preparing spectra for submission to e.g. the BAA database. Those are a great set of spectra. I've also chased some objects to very low altitude. While you don't get anything like the quality, you can still get enough photons for some useful data. To avoid any confusion on the atmospheric response correction, it is not supposed to get rid of the telluric lines. These are the sharp lines and absorption bands due to water and molecular oxygen. They are harder to get rid of, and while there are ways to do it, typically they are left in spectra unless they need to be removed for measurement purposes. They can actually be useful when submitting spectra to databases as they give anyone who then downloads the spectra the ability to redo the wavelength calibration, using the same approach for spectra taken by different observers. The atmospheric correction removes the continuous transmission/absorption component across the whole spectrum. I could be wrong, but I think this is due to Rayleigh scattering in the Earth's atmosphere. The same affect that gives the sky its blue colour in daytime and makes the Sun look red when it is near the horizon. When you correct for this in a spectrum, your response correction curve should be very smooth. See the below plots of a low resolution wide wavelength range response correction curve, and a narrow range high resolution curve. Let me know if you need any pointers on database submission. Note though that the instrument response for a slit spectrograph is only smooth provided a flat has been used otherwise it will have ripples from the camera response. (A good reason for always using a flat). Even then I find that my ALPY instrument response has a kink in it which I believe is quite common. (a combination of the flat lamp and atmospheric extinction curves) You can see it in my MILES star report here for example. As Andy says, BeSS standard practise is to leave the telluric lines in when submitting to the database. When analysing spectra though you will want to remove them and it is quite possible for amateurs to do this. For high resolution spectra where the individual lines are visible it is quite straightforward using a standard template for O2 and H2O lines which is scaled to fit the magnitude of the lines. Some software eg ISIS Visual spec have this function built in. (This technique of measuring stars at different air masses is used by professionals (and sometimes by amateurs) to correct for all atmospheric effects including extinction rather than trying to match the air mass of reference star as is commonly used by amateurs. Correction for extinction (rather than just the telluric bands) using this technique though needs photometric skies so the atmospheric conditions do not change between the two measurements at different air masses. Firstly again thanks for all the above. My contributions above were all made without flats to keep it simple to start with. But Andy (and I note Robin's comments above too) said I must use flats if I wanted to contribute to the BAA spectral Database. Having now got to grips application of flats, I recognise that this is important and it will be a standard part of my routine. In viewing the flats, I note the ripple on the image. The ripples are parallel to the slit direction which indicates to me that the majority of the effect is in the spectroscope rather than the camera. I also see thinner striations perpendicular which I reckon are due to imperfections or dust in the slit. Anyway - these factors do need to be corrected for. Eye-balling the ripples, I would say there is quite strong wavelength periodicity. I suggest that this is due to imperfection in the grating - maybe edge effects where one grating line meets another and mostly the same at each interface, so periodic. Manufacturing gratings with the blazing as good as it appears to be must be quite an engineering feat. When I get time, I'd like to try and model these effects. When you take a flat with a slit spectrograph, you are effectively taking a spectrum of the flat lamp. The ripples are from the wavelength response of the camera. These are also imprinted on the star spectrum of course so when you divide the star spectrum image by the flat they cancel out along with any other flat defects. The attached paper describes the mechanism which produces these ripples in CCD sensors (page7-11) The same effect is also seen in CMOS sensors. Interesting. Thanks for alerting me to this. I had always assumed that the spectral responses of these detectors was smooth. I will try to get the ripple response determined for my camera. Here is the ripple response of my camera compared with your ATIK-414. (I digitised values from your image, so there are picking errors.) In the overlap range, 420-730 nm I get a slightly higher standard deviation (0.59%) than yours, but the correspondence is gratifying. Again, thanks for putting me straight on this. Yes the ATK 414 is one of the best for low dispersion ripples but sadly one of the worst for high dispersion ripples seen with the LHIRES at the highest resolution (unlike its predecessor the 314 which is good at both low and high dispersion.) Unfortunately none of this is known until one tries to use them for spectroscopy. The low dispersion ripples are all but eliminated by using a flat but the high dispersion ripples can be really tough to remove.